This post gives an overview over what has been announced and concludes with an analysis of what it all means. More support for touch gestures. full screen mode for all Apple apps with on-demand menu bar. Resume: restart app or system and open documents, window positions, etc. are all remembered. Auto-save and Version: no manual saving needed, old versions can be revisited with a Time-Machine-like user interface. Air Drop: peer-to-peer file sharing via Bonjour. Coming in July, for $29.99, only via the App Store, a download of 3.6GB (Jobs called that size “similar to an HD movie”). Installation does not require a restart. Hardware requirements: “Your Mac must have an Intel Core 2 Duo, Core i3, Core i5, Core i7, or Xeon processor to run Lion.” That means that 32bit Core Duos are out. 2GB RAM are also required. Face recognition for Photo booth lets you circle birds over your head, bulge your eyes (only), etc. Mail can have up to three vertical panes: folders, messages, current message. Great for wide-screen displays. Coming in Fall. Probably alongside a new iPhone, new iPods, and possibly a deluxe version of the iPad. Notification center: swipe down from the top to get a list of new messages, notifications, etc. The same gesture that Android uses for showing its notifications. A good choice, thankfully Apple did not deviate from Android just to be different. Newsstand: like iBooks, but for magazines. Twitter integration: system-wide single sign-on. Tweet photos (optionally incl. text and location) from Camera/Photos, videos from the YouTube app, URLs from Safari, locations from the Maps app. Twitter photos are used for Contacts. Reminders: an advanced todo list, triggered by time or by changes in your geo-location (remind me once I leave work, remind me once I arrive at the supermarket). Syncs with iCal on Mac OS and Outlook on Windows. Camera: quickly start from lock screen, press volume up button to take a picture. Mail: flag messages, search message content (even on server). Calendar: week view on iPhone, year view on iPad. Let’s hope that you can also swipe to move in time and tap (on a day etc.) to create a new event. No tethering with iTunes needed for the initial setup. Just log in with your Apple ID. Wireless backup to iCloud, once a day. Restore on a new device should your old one get lost or destroyed. Apps do more: Mail creates mailboxes, Camera can edit photos, Calendar can create calendars, etc. Game center: gets social features, such as games recommendations, friends of friends, suggesting an opponent, etc. iMessage: an Internet-based instant messaging service for all iOS 5 users that seamlessly integrates SMS . Very similar to Skype. Or iChat, for that matter. Based on the same technology as Apple’s push notifications and thus will probably scale well. Airplay mirroring  from the iPad to the Apple TV (useful for presentations). Buttonless iPad operation: gestures for going home, showing the app switcher and for switching apps. Capacity: 5GB (email, files, etc. ), not counting purchased music, apps, books, photostream. Supported on iOS, Mac OS, Windows. Once Apple thought of a Mac as the digital hub, now it’s the cloud. That is necessary, because any device can produce new content these days (pictures taken on cell phones etc. ), not just Macs and PCs. Continuous syncing (a word that Apple avoids, but it’s still what’s going on) of: contacts, calendar events, mail, music, apps. Documents in the cloud (similar to DropBox): built into Pages, Numbers, Keynote. API for 3rd parties: sync app files and key-value data. Photo stream: pictures you take on an iOS device are stored in the cloud, but only for 30 days. Mac OS always gets all of those photos; iOS the most recent 1000 ones; Apple TV can also access it. To keep a photo permanently, you move it to an album. iTunes in the cloud: Apple knows what music you have purchased and you can push it to any of your devices. This nicely takes care of syncing and also serves as a backup. iTunes Match: pay $24.99 a year and iTunes examines your ripped audio files and adds them to your purchases. You only have to upload files that are not available on iTunes. I’m assuming that after that procedure, you own the newly added music and you can stop paying the $24.99. Notifications: A huge improvement. No more dialogs if something goes wrong. What I like about Android, though, is that it also puts activities here (ongoing downloads, Music that is currently playing, etc.). Apple should copy that. Independence from PC: The term “Post-PC” finally makes sense. Great work. There is even a daily wireless backup to iCloud. Faster web browsing: is possibly in the new Safari. At the very least we will have tabs on the iPad! Universal file system: cloud-syncing files per app is an improvement. But two problems are still unresolved: how to group files across apps (or even within apps) and working on the same file with multiple apps. Read the above mentioned post for more ideas about a file system. iPad virtual keyboard: I would love to have an additional row with numbers and parentheses. Instead, we got a thumb keyboard (which I don’t care for much). Configurable preferred web browser: not sure, yet. Should not be that big a deal to add. Quickly going to camera mode. You can do that directly from the lock screen now, you don’t even have to log in (but then can’t do anything but take a picture). Quickly taking a picture. The old virtual shutter button was difficult to hit, using the volume up button for this purpose is great, especially on the iPhone 4. Support for multiple users: Not yet, maybe not ever. Mission Control on Lion: offers an overview of the “main screen” with all windows, grouped by (non-full-screen) app. Additionally, there are spaces for Dashboard and full screen apps. You can also create new spaces and drag apps or windows to them. What I miss is to run two apps in full-screen mode at the same time, on a split screen. Windows 8 has this feature and I think it’s great. The dock still shows running apps (similar functionality to Mission Control) and favorite apps (similar functionality to Launch Pad). The former functionality is especially confusing if an app is spread over several spaces. Instead, the dock could show thumbnails of all open spaces. Using it for favorite apps seems OK. Launch Pad is not a space. It is handled like an app and can be launched via the Dock or a gesture. The For more ideas on Mac window management, you can read my post “Fixing Mac OS window management”. It’s all a bit confusing right now: We already have Face Time and iChat. Face Time is here to stay, but will it be integrated with iMessage? 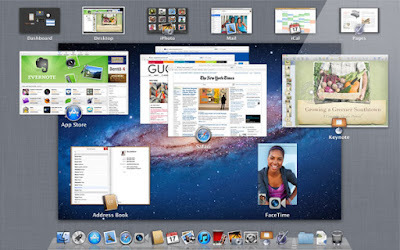 What will happen to the Mac-OS-X-only iChat? Will it be replaced with iMessage? A well-informed little birdie tells me that Apple’s phone carrier partners around the world found out about iMessages when we did: during today’s keynote. I love that it’s available on the iPad, too. Without SMS integration? Photo stream: I don’t fully understand the 30 day limit and separating it from album photos. They could have made it part of the 5GB storage capacity and permanent. Apple’s social features: Contrary to an idea of mine, Apple did not make iCloud social (but they did make it free). Instead, game center is getting social features and those make a lot of sense to me (as opposed to Ping). Peer-to-peer sync: is not supported by iCloud, but would be nice to have in scenarios where you carry a laptop and an iOS device and don’t have internet access.